"Favorite place in Mankato! The Person Family knows how to run good restaurants. Also, check out Number 4, Neighbors and The Tav on the Ave! All very good food and great service! I'm hungry now"
"Amazing food! Great atmosphere whether you are out on a romantic date, having wine with the girls or enjoying some family time with the kiddos"
"My fiancé and I have treasured Dino's as a fabulous date night restaurant for the past 5 years. We most recently went on the 4th of July and devoured their delicious pesto cheese bread sticks and AMAZING summer special"
"Of all the restaurants available, we chose Dino's! Had been there a couple years before and just had to go again. The location is convenient, atmosphere is good and the pizza was great. An 18" pizza easily satisfied our group of six. Our server served us very well"
"This restaurant is a fun and great place to eat. Great pizza and Italian meals. Is a real favorite of our daughter-in-law when she and our son visit from the Buffalo NY area. It has a great atmosphere and great staff"
"First off the atmosphere is amazing. Very good decor. Love the theme and layout. The pizza is very good. Love pizza and this is some of the best. The sauce is thick and seasoned to perfection. The crust is a thin style and has the right crunch and crispness. The ingredients are wholesome and fresh tasting"
"I eat a lot of pizza. A lot. This rating is based on thin crust style pizza. The pizza is the best I have had. It has a crunchy flavorful crust and very generous toppings (in fact, don't order extra cheese cause it has plenty). The staff is always very friendly and welcoming. The atmosphere is perfect for a evening with your sweetie or a group of friends"
"Great food!! Spectacular service!! Very nice & clean!! Prices were not fast food...it's not a fast food restaurant people! Definitely would recommend"
"Came to Mankato for work and dr.s and someone recommended to go to Dinos for supper and very glad we listened. 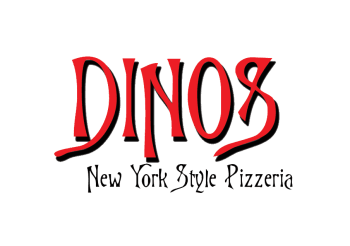 The pizza was great and everyone working was very personable and the prices were fantastic... no complaints at all.. next we go back we will definitely go and eat there"
"Pizza at Dino's is wonderful. We have never had a bad meal there. Staff is friendly and always ready to help. Great place all around"
"I have been to this restaurant twice since I moved to Mankato for lunch. The atmosphere is great, and the prices very reasonable - particularly the weekday lunch special - a small pizza, salad, and soda for around $10. The pizza is delicious, salad a tad skimpy, but still good. Parking can be a challenge"